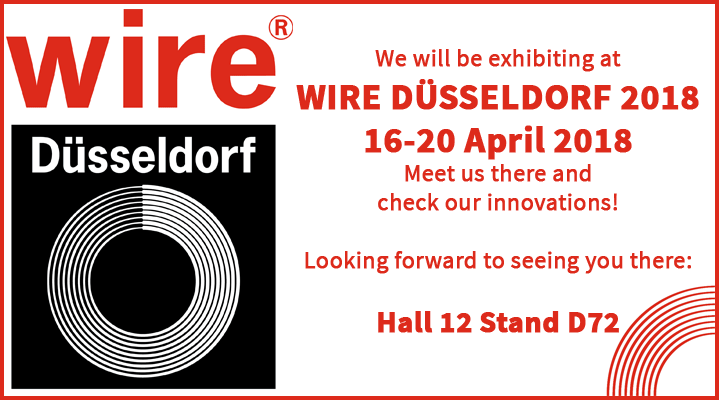 We will be exhibiting at WIRE DÜSSELDORF 2018, 16-20 April 2018. SICME ITALIA IMPIANTI MC will be glad to receive your visit in Hall 12 Stand D72 to show you its latest innovations. 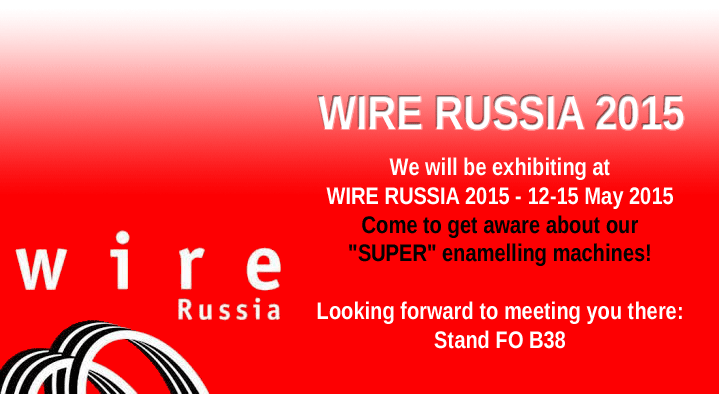 We will be exhibiting at WIRE SOUTHAMERICA 2015, 6-8 October 2015. Come to get aware about our "SUPER" enamelling machines! We will be exhibiting at WIRE SOUTHEAST ASIA 2015, 16-18 September 2015. 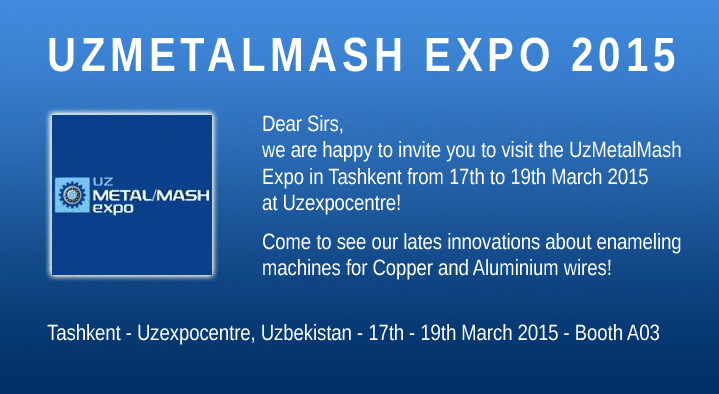 Dear Sirs, we are happy to invite you to visit the UzMetalMash Expo in Tashkent from 17th to 19th March 2015 at Uzexpocentre! Come to see our lates innovations about enameling machines for Copper and Aluminium wires! The International Wire and Cable Trade Fair in Russia. 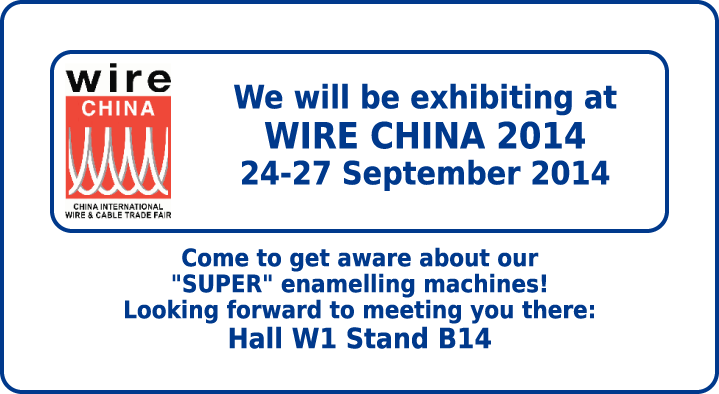 SICME ITALIAIMPIANTI srl will partecipate to the wire China 2014 - from 24th to 27th September 2014 - BOOTH: W1B14. SICME ITALIAIMPIANTI srl will be glad and proud to introduce the SUPER COMPACT machine to all visitors. 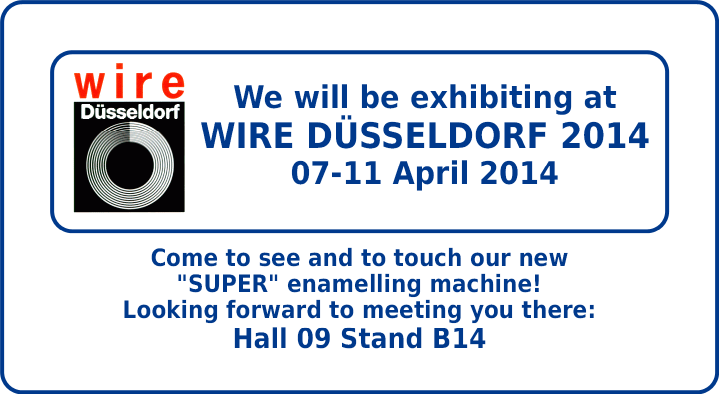 SICME ITALIAIMPIANTI srl will partecipate to the Wire Düsseldorf 2014 - from 07th to 11th April 2014 - BOOTH: Hall 09 Stand B14. SICME ITALIAIMPIANTI srl will be glad and proud to show the new SUPER EG COMPACT machine. A detailed brochure with plant schemas and technical datas is avaiable below, in JPEG format, ready to download.